Apterae of Elatobium abietinum are pale to dark green (see first picture below), sometimes with a partial wax bloom. The siphunculi are cylindrical, long, thin, pale and tend to be slightly s-curved. They are up to 2.5 times the length of the cauda which is pale and pointed. The body length of Elatobium abietinum apterae is 1.0-2.0 mm. 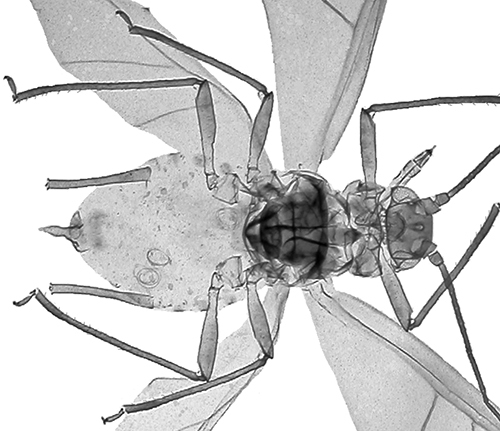 The clarified slide mounts below are of adult viviparaous female Elatobium abietinum : wingless, and winged. Elatobium abietinum spend all year on the needles of spruce, especially Sitka spruce (Picea sitchensis) and Norway spruce (Picea abies and, much less commonly fir (Abies spp.). 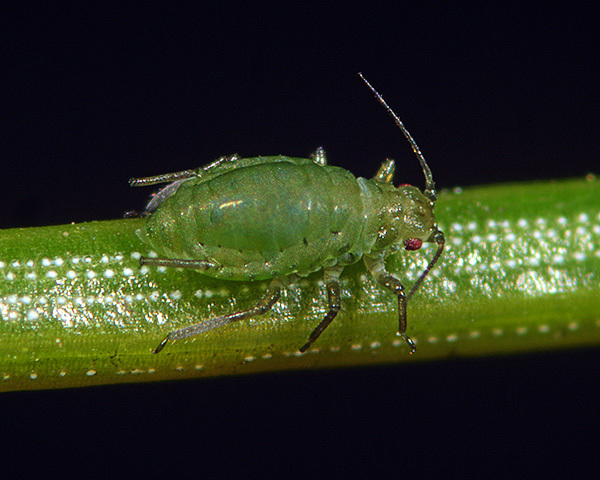 The green spruce aphid has an unusual life cycle in that populations often continue to feed and reproduce through the winter. In spring and early summer alates are produced in response to the changing nutritional status of the host. They then migrate to other spruce where their nymphs aestivate for the summer before resuming development in autumn. 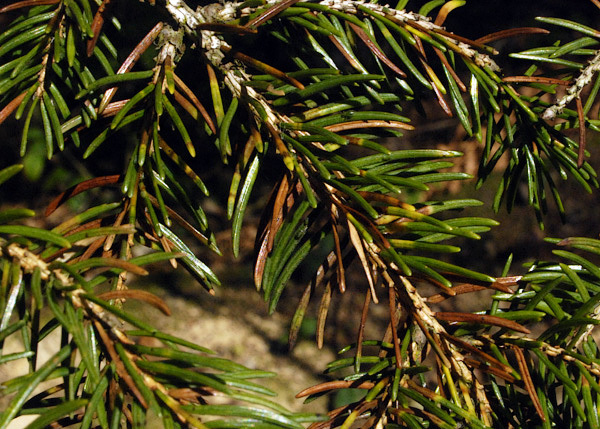 Elatobium abietinum can be a serious forestry pest with colonies on spruce causing discoloration and loss of old needles (see second picture above), sometimes causing serious defoliation.The species is native to Europe, but it has now spread to Australia, New Zealand, Chile and North America. Populations in continental Europe have a sexual stage, but elsewhere overwintering is by parthenogenetic forms. Elatobium abietinum has been recorded on 14 Picea species - and at least 5 Abies species (Abies cephalonica, Abies coerulea, Abies homolepis, Abies kosteri, Abies lasiocarpa). 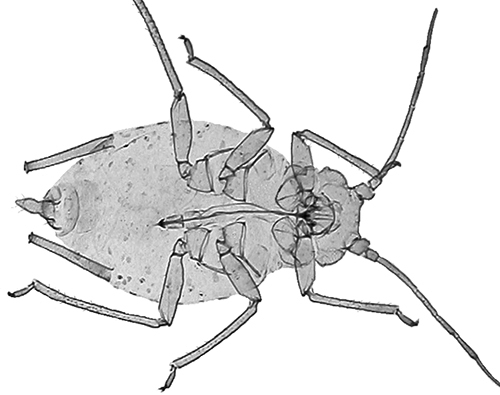 Of the 31 aphid species Blackman & Eastop list as feeding on sitka spruce (Picea sitchensis) Baker (2015) lists 16 as occurring in Britain: Adelges abietis, Adelges cooleyi, Adelges laricis, Adelges viridis, Aphis fabae, Cinara costata, Cinara piceae, Cinara piceicola, Cinara pilicornis, Cinara pruinosa, Elatobium abietinum, Mindarus obliquus, Neomyzus circumflexus, Pachypappella lactea, Pineus similis, and Prociphilus xylostei.